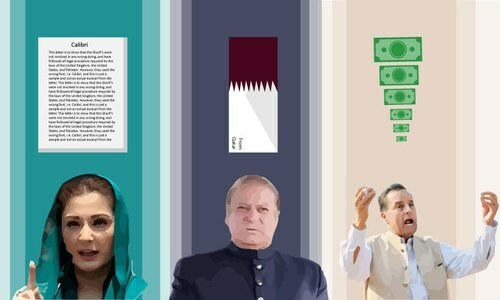 LAHORE: As the Pakis­tan Muslim League-Nawaz (PML-N) prepares to give a rousing welcome to ousted prime minister Nawaz Sharif and his daughter Maryam Nawaz on their arrival in Lahore on Friday, the party supremo has pledged that he will liberate Pakistan from “those who are running a state above the state”. PML-N president Shah­baz Sharif, on Wednesday, spent a busy day meeting workers in various areas of Lahore and mobilising them for the welcome rally planned at the Allama Iqbal International Airport to receive their leader, come what may. Later while talking to journalists, the former premier said he wished he could address his supporters at the Lahore airport. “I ask the people, especially women, to come out of their homes like tigers, and cross all barricades to reach the Lahore airport. No one can stop a mass gathering of the people,” he said, adding that no one had ever gotten freedom in a platter, because it demands sacrifice. The former premier warned that he could no longer hold ‘secrets’ in his heart. “I have shown great patience but I can no longer remain silent about those conspirators as it will be unfair for the coming generations. Those who were behind conspiracies against me and my government will be exposed,” he said. He asked who was behind his expulsion from the Prime Minister House, who had gotten a verdict of their choice against him, who had elected [Sadiq] Sanjrani as Senate chairman and imposed their will on the people of Pakistan in the election. Nawaz Sharif said he regretted the loss of his “close friends”. “Pakistan has been placed on the Financial Action Task Force’s grey list (again). When I had talked about (taking certain measures) they termed it news leaks,” he said, and added that ever since his expulsion, the country’s economy had suffered a lot and Pakistani currency had been devalued. Speaking to workers at public meetings in Lahore, Shahbaz Sharif said on July 13, the people of Pakistan would give their verdict and come out in large numbers to give a historic welcome to Nawaz Sharif. 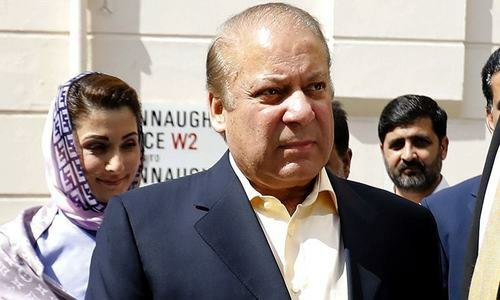 He said Nawaz Sharif’s opponents suffered from the delusion that he would not return from London after the verdict in the Avenfield reference. “Nawaz Sharif rules the hearts of the people and that will become clear on July 13,” he said. 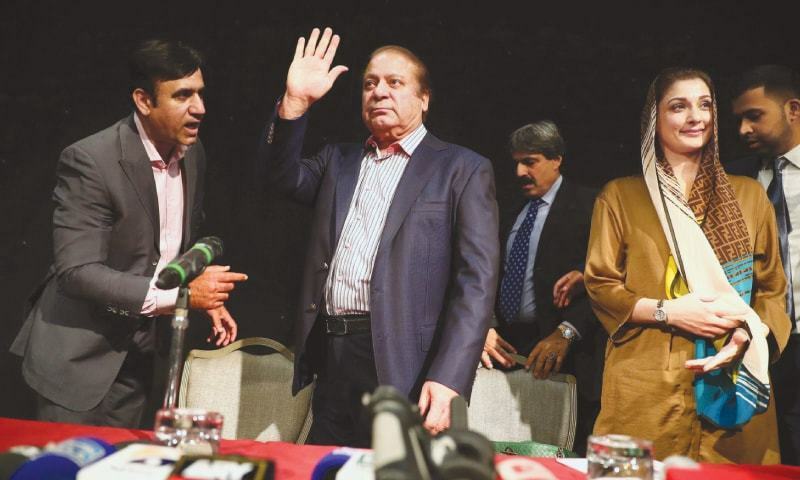 Nawaz's return: will he or won't he? With his lavish life style and mughal emperor tendencies, he is the last person for such a job. Nawaz Shareef is our hero. We fully agree with his point of view. We will vote for PMLN on the 25th of July. Brings ur kids with you. Let make institutions above your ego. You have not raised your voice for supremacy of elected govt for the last thirty years. The supremacy vote came to ur mind when you realize ur defeat. Kindly do not derail the system. Unbelievable! Cmon, you failed to give the money trail, you've been PROVEN criminal. Stop all this. I can't believe people still support him. The state above state has been there for 70 plus years.You being corrupt and exposed by Panama leaks has nothing to do with it. The only thing that pains you is that the “state above state” pursued your case instead of letting it go as in the past. Do whatever you like but first answer about money trail of London apartments, please. Also, bring along Hasan, Hussain and Ishaq Dar - we are you leaving them behind in London? I know why - so that you loot this country further and launder money to your sons in London again. Right? Can you pl return our billions you and your family looted from Pak. We can think about forgiving you but first return our money please. Better shift the priority to the current situation i.e. how to get facilities in Jail. Pakistan is proving that crime never pays off. MNS, we are not bothered by the State above the state. What hurts us is the harm you and your kind do us the people below the state! NS had a fair chance to prove his point in the court, his failure established the fact that he is corrupt, which most people already new. All this drama is to save the political carrier of his daughter. “Nawaz Sharif rules the hearts of the people and that will become clear on July 13,” It's high time Shahbaz Sharif realize that Pakistan is a country of 22 crore people. Gathering a few thousand people is no big deal and proves nothing. Shabaz is spending millions to pay poor people to welcome convicted criminals on their arrivals. Every citizen should support Nawaz Sharif stance..irrespective of his political association. Love you Mian Sb. We stand with him and real democratic government. He will rid Pakistan of 'state above state' by installing his brother, nephew, daughter, son-in-law, and dozens of other relatives on key state positions. Doesn't he understand that he os banned for life!!! Your words could have weight only if you had shown the same courage and character in denouncing your past of supporting military dictator Zia. "The former premier warned that he could no longer hold ‘secrets’ in his heart." and thus violate his oath while lecturing others to conform to their oath. 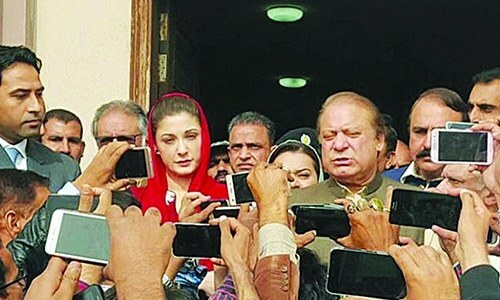 Simply, a convicted ex PM and his daughter are shredding crocodile's tears and trying to get public sympathies about their 10 and 7 years jail sentences against NAB's 'corruption and corrupt practices' article 9(a)5. Jail is waiting and will welcome them on Friday, 13 July and treat them like any other criminal! Currently, The Nation is celebrating the departure of a corrupt EX-PM !!!! Serve your jail sentence first so that you set an example. Good. This must be done. The big question is, How ? You had this chance for 30 years to change the "state within a state" situation, but instead you chose to plunder, loot, bribe, launder money and destroy institutions. You are a now convicted felon and have fooled the people of Pakistan long enough. You have stolen from the People of Pakistan. Your People! Sir, you do not even understand what "Sanctity of the Vote" means. Where are your 2013 election promises? Industry remains in disarray. There is no gas, no power. There are half a million college graduates with no jobs. The suicide rate among our young is at its highest. You said long ago that we could become an Asian Tiger? Today, after 30 years we are still struggling to get out the Jungle. So, stop hiding behind the veil of your brand of democracy & face reality. As a citizen of Pakistan you have been tried in a court of the People of Pakistan and found to be guilty. You have destroyed the sanctity of my vote! vote for Nawaz, the lion. NS stands out among Pak politicians when it comes to struggles for civilian supremacy in recent times. 100% correct But he came into power with the help of these guys. @BhaRAT its obvious. Dacoits, robbers n looters of public money are always the heroes of bharat. A mouse trap is well placed in the name of elections, all will take bait-irresistible. What about bringing with you, your 2 sons and ishaq dar to pakistan as they are also fugitives then you have my support otherwise no thanks I'll keep my family members home no need to risk them becouse of your family. A clear distinction between brave Democrats and coward Dictators! Any action to control the actions of state above state are long waited. To do so need a courage and unity among the political forces which is probably the hardest bit. Its time all politicians and people stood up for civilian supremacy and rule inline with the countries constitution. Answer the question please.... How did you become so rich... Just that please. The same state above the state brought you in limelight in the early 80s. You used that advantage fully for the next two decades. However, you ran afoul and also got exposed through Panama papers . You are not a political martyr , neither a victim but rather a beneficiary of the “hidden hand”. First thing first, spend 10 years behind bars. He has emerged a real leader, a hero, after weathering and going through travails of controlled democracy. His vote bank has increased manifold. we stand by his narrative and support him in all respect. Why didn't he do that when he was in power for so long in Islamabad as well as in Lahore since last 37 plus years? These people have de-valued words like "freedom" and "slavery"
Everyone knows that it is 'selection' not 'election' in Pakistan. I do not agree with N's policies but I will vote for him in retaliation to secret hands. I firmly agree with Nawaz that if Pakistan has to move forward, it needs to break those secret hands. A brave and bold decision. Another Zulfikar Ali Bhutto in the making. Our first priority is to get rid of corruption and we have started with the man on top. @BhaRAT how would "Bharat" i.e. India vote for Nawaz Sharif? What NS is saying needs to be done but may be he is not the right guy for it. @BhaRAT your hero? You must be corrupt then too! @Dasti why? Support a convicted criminal? The Indians are all concerned about Nawaz shareef...we should make him the PM of Hindustan! Pakistani nation is very quickly getting fed with words such as “certain people, hidden hand, those people”!!! If Nawaz has any courage he should name those people/person in open!! He and Maryam deserve Muchh Jail. Nawaz you are a convicted criminal and you are in no position to do anything anymore. @BhaRAT I am sorry to say. But what a hero.!!! Theif as hero.???? Anyone going to his welcome party should ask themselves a simple question. Why is it that Pakistani economy has only grown modestly over the last 30 years while Sharif family wealth has increased exponentially? The answer lies in the abuse of power. If you still support Nawaz (not PMLN) that's your choice the but don't complain about the economy. Yes he is showing great courage to retain the money he stole from Pakistan. The bitter truth: Only Nawaz Sharif can improve relations with India. Only improving relations with India can save Pakistan from its present mess. Take your call. It is still being impossible for Nawaz Sharif to digest that he has been convicted for his crimes. He thinks that Panama leak is also a scheme of state above the state. He and his family still don't understand that there is a new generation of voters who are under the age of 25 years and very well versatile in using internet technology that enables them to read, and watch and listen news from around the world. And, understand that Panama Leaks is a independently released against corruption. Just tell people how did you get all this money and how did you transfer it to buy all properties abroad, who and how the same agencies helped you to win elections after elections and people will stand by you. If you have a vision , courage and honesty then Pakistan will support you. He keeps beating about every irrelevant bush but is unable and/or incapable of telling the truth of the money trail on multiple opportunities provided to him and his other accomplices due to which he along with them now stands convicted. How can/should anybody believe in anything he says after he has failed miserably to prove his innocence? Do some thing to rid the country from the massive IMF loan taken by your government , bring back the stolen money. Sell your london flats and return the money to Pakistan. PMLN governance has been bad throughout. Corruption and Pakistan cannot go together anymore. The mood is totally changed. No more adventure like the one carried out by PMLN against Supreme Court and the then CJ. Any attempt to destabilize the care taker government will result in unbearable loss to those talking law n order into their own hands. Says someone who has always thought that he was above everyone. If he had provided good governance, more people would have stood beside him. He was always absent from the parliament ( so was IK), now he is talking about the supremacy of civilian institution. Mr Sharif and his daughter are brave. Please bring your sons with you. How about your crimes ans sins? Sir, what you don't realise is that you are a convicted criminal now and so is your daughter and son-in-law. The remainder of your family is still running around the country as if they own it. You do not hold any office of either PML-N or the government. You are just a convicted criminal. We can't wait to see you in prison. Welcome back to Pakistan. Mr Sharif is trying to be a martyr. He is expecting to have a sympathy wave and get himself elected on 25th July. But its a huge gamble. If PML-N fails to get sweeping majority, he will stay put in jail for several years. I now hope that PML gets the majority and NS doesn't become a scapegoat. Shame on Nawaz Sharif. Those who follow him are alos involved in corruption. What is the cost of 4 Flats in London? Nawaz Mian is right, he should fight to make Pakistan a true democracy. @Abdul Rehman - Yes. You are right. He did commit wrong acts, but at this time he is trying to correct himself. And the people of the state want to get rid of you. Kindly dont come back, you are not wanted. Don't expect any real work from NS and his party for the betterment for the People Of Pakistan in terms of education, health, and addressing the core issues like water, power, infrastructure. He and his party is interested in doing projects that have face value. The bottom line, he is not interested in building the nation. I urge the People of Pakistan don't vote for the political parties that have already been tried. If next part does not perform, throw them out. Take charge, don't expect the political leaders will solve your problems, get involved. @Bakht But he has submitted himself to be sent to the jail, which shows he is sincere in what he says! So what you were doing in your three times premiership then? Pakistan needs you more than ever. By the time you come out of jail, country will be a huge mess. Please show us the money trail only! When will Nawaz Sharif realize that he is a lowly educated, corrupt and incompetent politician? Sorry no one is interested in coming out for criminals. I am with you Pakistan to get rid of "State over state"
You'll have to do that from the jail Nawaz Sharif. But as for now, the country has rid itself of a dishonest leader. You couldn't even rid Pakistan of load shedding, what makes you think you can rid Pakistan of anything.